Question: When is a twenty-fifth anniversary not a twenty-fifth anniversary? When it was held forty seven years ago. Monk plays his signature ‘Round Midnight in person. If anyone knows how it should be played, it is the man who wrote it. Bum notes idiosyncratic notes and all. 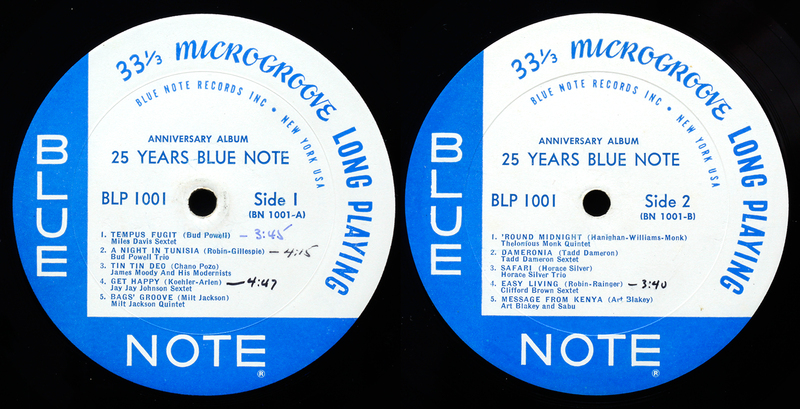 An original Blue Note pressing, liner notes and label annotated by someone needing to know the precise track lengths. 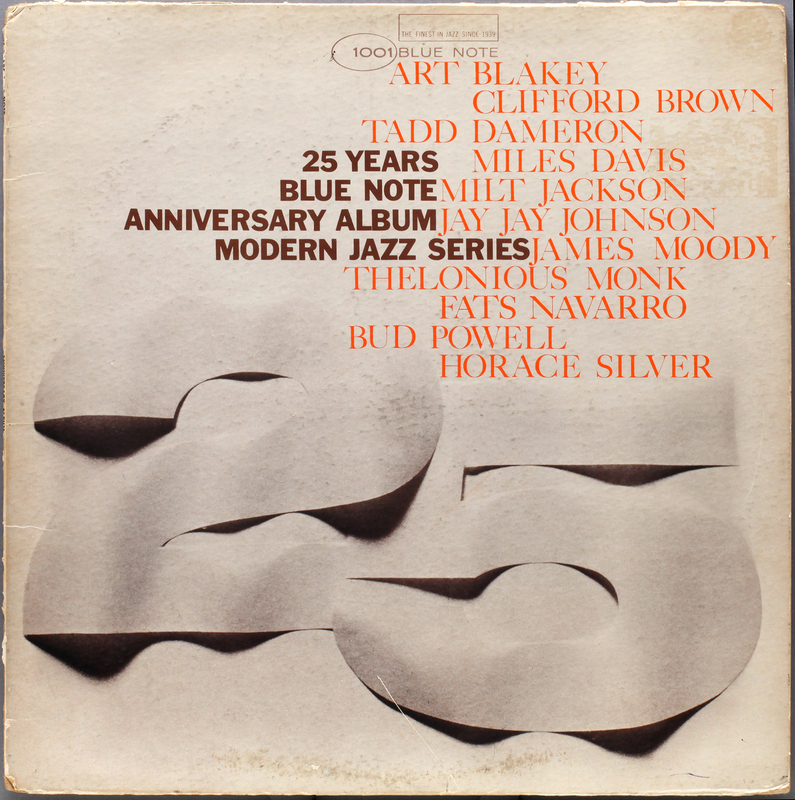 Twenty five years of Blue Note, 1939-64. Most of the tracks were recorded in the late Forties and early Fifties, but remastered in 1964 by Van Gelder from the original tapes specially for this anniversary release, so they will have benefited from a decade of technology improvement over the original release version. Classic recordings from the early years, pressed by Plastylite, probably sounding as good as they will ever do. Far better than I remember hearing previously. Max Roach’s snare and cymbal percussion on Night in Tunisia is so immaculately captured, it puts many later recordings to shame. Difficult type of record to put a value on. “Compilations” are generally considered to have little or no value to collectors. Yet this is a 1964 original Plastylite pressing, NY labels and VAN GELDER engraved, and all tracks are remastered by Van Gelder from original tapes to a standard not previously heard. It is not a “compilation” of old recordings, they are RVG exclusive remasterings. However to the grizzled old collector they are not “the original artefact”. I concluded, it is valuable to me, but not to many other people. A bargain, priced at a little over a tenner. 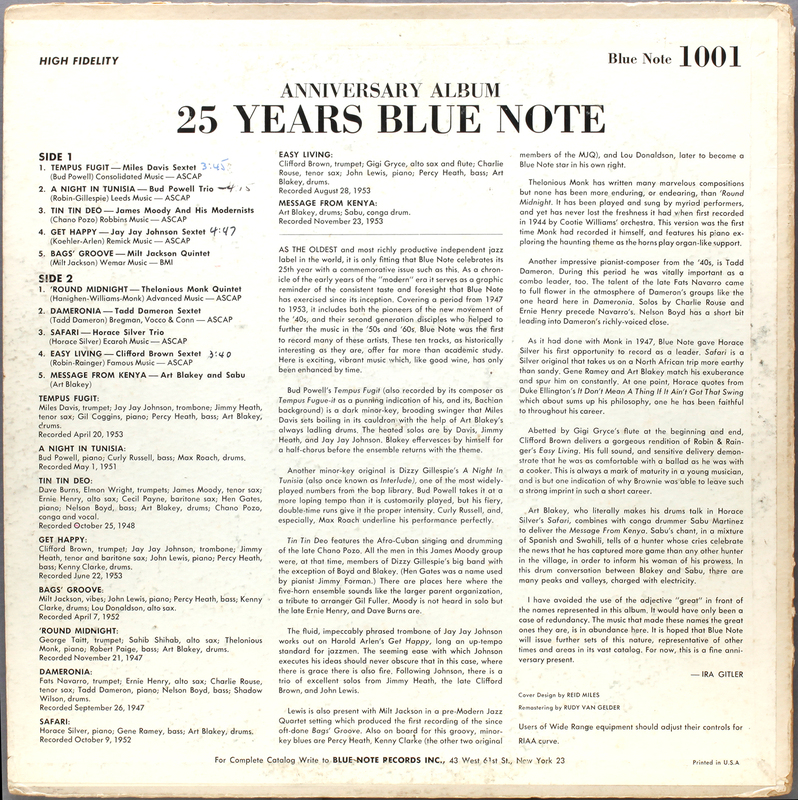 This entry was posted in Blue Note, Bud Powell, Thelonius Monk and tagged Art Blakey, Bud Powell, Curly Russell, George Tait, Max Roach, Robert Paige, Sahib Shihab, Thelonious Monk by LondonJazzCollector. Bookmark the permalink. I’m sure you referred to “Into the hot” as opposed to “Out of the cool”, both on Impulse. pianos played by Taylor could never stay tuned after 1960 as he chose his percussion (non)technique. after 50 years I must admit that his music, today, is very hard to bear and enjoy by me too, a Free Jazz lover. maybe the piano wasn’t a free instrument as reeds. I recognize his voice as important for a brief period but I seldom rehear one of his records. I think the piano tuner may in fact have been working *after* CT arrived too. The sound isn’t great. BUt it does remind me of another approach: Gil Evans’ OUT OF THE HOT. If memory serves, there are three tracks on that that are effectively the Cecil Taylor Unit with all of part of the GE Orchestra and they are frankly terrific. Perhaps CT is better (more restrained, contained, whatever) as a sideman… Anyway HOT is heartily recommended — I was playing it just last w/e and had forgotten how marvellous it is: those characteristic GE charts, wonderful voicings and textures…..
Cecil Taylor *is* a challenge. I guess it’s meant to be — but look out for NEW YORK CITY R&B issued jointly under Taylor’s and Buell Neidlinger’s names. A gateway record. Earwigged some samples on line, Interesting opening track “O P” dedicated to Oscar Pettiford, nice, and an Ellington “closer”, the murder of “Things aint what they used to be”.. Could be fun, though it still sounds to me a bit like they let the piano-tuner carry on working until Cecil arrives. Archie Shepp on the other hand I can “dig”. Thanks for the pointer. And the utterly marvellous JAZZ BARONESS, by Hannah Rothschild, the story of Baroness Pannonica de Koenigswarter, can still be seen on YouTube but not, sadly, on the BBC 4 website. (I recall reading somewhere a music critic of the day saying to I think Miles Davis “What’s he doing here? (indicating towards Monk) Why don’t you hire yourself a proper pianist?”). I admit it took me a while to tune my ear to his sometimes idiosyncratic choice of notes, but I got there in the end. Its Cecil Taylor I still find a little challenging. Thanks for the links Alun. Looks like good stuff. I don’t feel so good: I haven’t got this record and, most of all, I drink, let’s say, DMM, i.e. I don’t drink wine. please don’t get me outa here! “Doctors told me that wine, women and song would be my downfall. Poilly Fumé – the 47 West 63rd St of vin blanc, excellent choice. My Cotes de Rhone Village – a mere Pathé Marconi French reissue. Adequate but no more. Vintage records, vintage wines… a win win. Aha!! I have this album as well BUT: mine is a, believe it or not, Dutch Liberty pressing. Totally different front cover, but the back cover is the same and so is the track listing. The Liberty I have was released by “Bovema”, a Dutch company that would later become the national representative for EMI a.k.a. “EMI-Bovema”. I bought it for about 4 Euros in a 2nd hand books- and record store. You can all check out the photos by clicking HERE. The labels look horrible, but the vinyl is in superb shape thank heavens. As you can see, the label bears all the signs of a Dutch pressing in the outer ring of the label. Oh, and no trail off etchings besides a hastily squiggled catalog number. Last but not least: I doubt that all tracks for this release were taken from original master tapes for the simple reason that late forties recordings from both Powell and Monk on CD have all been, quote, “remastered by Rudy van Gelder from the original lacquer discs”. Once the early fifties titles arrive (both the Powell and Monk releases 1503, 1504, 1510 and 1511 comprise of cuts recorded between ’47 and ’53), it all of a sudden says “remastered by Rudy van Gelder from the original tapes”. Stunning comeback Matty, a Dutch Liberty, my head is spinning trying to fit that in to what I thought we know. Interesting about the remastering, not sure I follow the ins and outs, but I know these sound good, whatever the story. Need a clear head to decypher what has happened here. Raise a glass to unexpected coincidences. Mines a very rich and vibrant Cotes de Rhone Villages at this moment.